Should Comic Book Women Be Drawn zaidi Realisticly? mashabiki wanachagua: No way, it's part of thier charm! Who's your inayopendelewa Blond Femme Fatal? Who do wewe think would win in a fight? Is this spot just for comic book heroines, au for any heroines? a comment was made to the poll: Out of my inayopendelewa Femme Fatales in Marvel which do wewe like better. 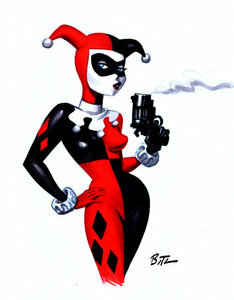 What Color Is Harley Quinn's Hair?